The U.S. Coast Guard’s National Maritime Center issued the following messages Jan. 25. Please note that there are three related communications below. Due to circumstance of exceptional necessity, the United States is currently not able to process Merchant Mariner Credentials (MMC) or related endorsements issued under the International Convention on Standards of Training, Certification and Watchkeeping for Seafarers (STCW), 1978, as amended. Pursuant to STCW Article VIII, dispensations may be granted for continued service for mariners operating on endorsements that expired on or after December 1, 2018, providing a renewal application was submitted to the National Maritime Center (NMC) and the company applied to the Coast Guard for dispensation. Requests should be submitted via e-mail to [email protected] and should include the ship name, IMO number, mariner name, mariner reference number, capacity per STCW regulations, company name, company point of contact, and valid mariner e-mail. The Coast Guard will consider dispensation requests in accordance with the provisions of STCW Article VIII. If approved, dispensations will expire May 31, 2019. Once the STCW dispensation letter is issued, mariners shall carry the letter and a copy of this bulletin with the MMC. Mariners who submitted applications for STCW endorsements prior to December 1, 2018, and are actively working or seeking employment may contact the NMC. Medical Certificates are only valid for 3 months from the expiration date in accordance with STCW Regulation I/9 and applications are being processed upon receipt. If you have questions, visit the NMC website, or contact the NMC Customer Service Center by using the NMC online chat system, by e-mailing [email protected], or by calling 1-888-IASKNMC (427-5662). Merchant Mariner Credentials (MMC) and Medical Certifications (National Endorsements only) that expire in December 2018, January 2019, or February 2019 are extended as valid until May 31, 2019. Mariners who are actively working on expired credentials that meet the expiration criteria must carry the expired credential with a copy of the attached letter. The following items that expire in December 2018, January 2019, or February 2019 are extended to April 30, 2019: Additional Information (AI) letters, Qualified Assessor (QA) letters, Designated Examiner (DE) letters, Proctor approval letters, Approval to Test (ATT) letters, and mariner training course certificates. For mariners whose 90-day testing cycles were interrupted by Regional Exam Center (REC) closures (starting on December 26, 2018), the days the RECs were closed will not count against the 90-day period. REC appointment calendars will be re-opened once appropriations are restored and RECs are fully operational. 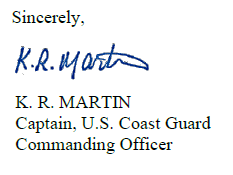 Due to the federal government’s partial lapse in appropriations for fiscal year 2019, the Coast Guard is unable to process mariner credentials in a timely manner. To provide relief to impacted mariners and under the authority of 46 United States Code § 7507 and § 7508, the Coast Guard is granting extensions effective immediately to National Endorsements and Medical Certificates until May 31, 2019, for mariners whose credentials expire in December 2018, January 2019, or February 2019. All mariners sailing under the authority of their National Endorsement(s) should print and retain a copy of this letter with their Merchant Mariner Credential (MMC) and Medical Certificate to produce it upon request by the U.S. Coast Guard, other agencies or officials. The National Maritime Center (NMC) does not intend to issue any separate or new MMCs to correspond to this extension for mariners sailing domestically. This extension does not apply to Standards of Training, Certification and Watchkeeping for Seafarers (STCW) endorsements. Applications submitted before or during the partial government shutdown will be processed as soon as possible once the NMC is reopened and is legally authorized to begin operations. If you have questions, visit the NMC website or contact the NMC Customer Service Center by using the NMC online chat system, by e-mailing [email protected], or by calling 1-888-IASKNMC (427-5662).